Every year, thousands of stray and unwanted animals are euthanized in shelters across the United States. Many of these deaths are the avoidable result of owners failing to spay and neuter their pets. The unexpected offspring of these liaisons often fill shelters and are never given the chance at happy, loving lives. Spaying and neutering also provides important health and behavioral benefits that improve your pet’s quality of life, and the relationship between you and your pet. Syosset Animal Hospital is proud to offer an innovative new procedure called laparoscopic spay. This minimally invasive alternative to a traditional spay uses telescopic-based incisions, as small as 5 millimeters, to precisely and safely disable the reproductive organs (ovaries). The use of the telescope allows a magnified view of the surgical site, without having to reveal it externally, allowing for a less painful procedure with a quicker recovery period. Laparoscopic spays target the ovaries only, allowing your pet’s uterus to remain in place, improving patient safety and minimizing organ damage. Syosset Animal Hospital veterinarians recommend spaying your pet at 5-9 months, depending on your pet’s breed, and ideally before the patient’s first heat (however the procedure can be done at any age). Spaying is a surgery that requires a 7 to 10 day recovery period (less if done laparoscopically) and may include medication. Lethargy is common for the first couple days following the procedure. Neutering is performed on male cats and dogs. This process castrates the animal, removing their testicles and making them unable to impregnate females. 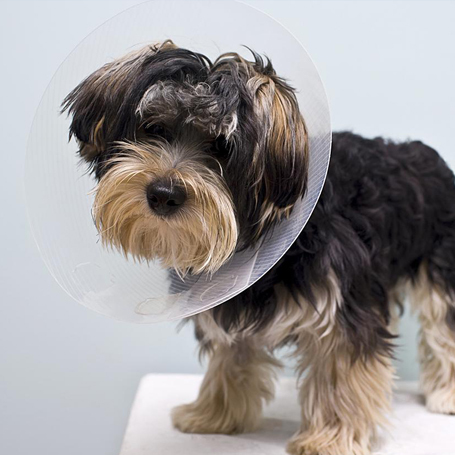 Neutering is advised when your pet is 5-9 months old, but can be performed on older animals as well. Although less invasive than spaying, neutering is still a major medical procedure that requires some recovery time. Following the procedure your pet will be sleepy from the anesthesia; this lethargy may last a couple days. Medication may be administered to combat pain. Owners must prevent the animal from licking or biting the incision to reduce the risk of infection. An e-collar will be fitted to prevent this from happening. To learn more about spaying and neutering, or to schedule an appointment, contact your Syosset Animal Hospital veterinarian today.